We are proud to feature local ingredients on our menu. Our menu includes options for everyone: meat-eaters and vegetarians alike! Order in-person at the truck, or call ahead to place your order over the phone for pick-up. Our rib trays are served with your choice of two sides (+$1 for mac & cheese). Slow-smoked pork ribs seasoned with our Signature Rub, finished on the grill with a savory glaze. Slow-smoked pork shoulder made with our Signature Rub. Slow-smoked beef brisket made with our Coffee Rub. 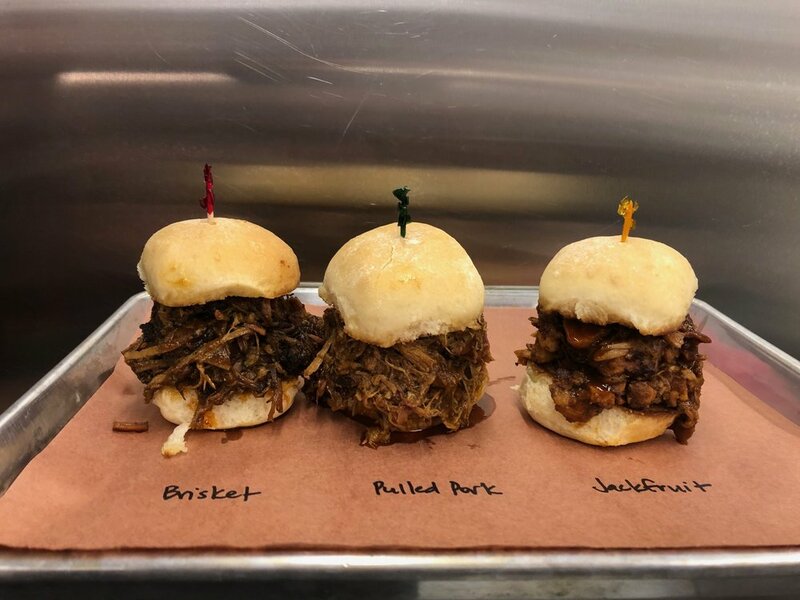 Slow-smoked young green jackfruit made with our Signature Rub, covered in our Vegan BBQ Sauce. Slow-smoked potato served open-faced, topped with brisket, pulled pork, baked beans, mac & cheese, and apple coleslaw. A boat of Rackhouse Mac & Cheese topped with slow-smoked pulled pork. Garnished with Granny Smith apples. Served in loving memory of KT. A protein-packed boat of baked beans loaded with your choice of brisket, pulled pork, or jackfruit, topped with cheese sauce, apple slaw, and thick-cut bacon. Our sandwiches are served on a toasted bun and include your choice of two sides (+$1 for mac & cheese). For smaller appetites, or when you want to try a bit of everything. Seasoned waffle fries, served hot and crispy. Pairs perfectly with our pulled jackfruit. Your choice of pork or vegan beans. Made with extra sharp Tillamook cheddar. We do private events! Contact us for info about our event and tailgate packages.